On April 18, with two weeks left in the federal election, Stephen Harper will receive a boost in his quest to achieve his long-lusted-after majority. That’s the day Sun News, the new conservative channel also known as Fox News North, goes live, as the final cog in the right-wing media machine is lowered into place. The right in Canada has been meticulously constructing this powerful device with the aid of Canada’s media moguls. Components include newspapers such as the National Post and all of the Sun papers, magazines like Maclean’s, most of talk radio, op-ed columnists such as the Globe and Mail’s Neil Reynolds and Margaret Wente and Talk Radio talking head John Robson and David Warren, the Blogging Tories network of 270 conservative bloggers, think-tanks spread from coast to coast pumping out hundreds of op-ed pieces each year, conservative Christian broadcasting. The machine sells conservative ideology to the Canadian public and attacks and discredits its opponents. Television was a gap, but Sun News will fill it. At one time the CTV’s Mike Duffy lent a helping hand in ramping up Harper government talking points. Who can forget the support he provided the Conservatives when, in 2007, they were branding Liberal leader Stéphane Dion as a flip-flopper (in contrast to straight-shooter Harper)? Duffy hosted a line-up of a half-dozen Tory ministers, including Harper, who all sang the same refrain: Dion the flip-flopper. It worked. The Tories branded Dion before he could explain himself to the Canadian people. But Duffy is gone, appointed to the Senate by an appreciative Harper, leaving a void on the television front. Now Harper will have the support of the full line-up of Sun News hosts and commentators. He’ll need lots of Senate seats to reward even a few loyal functionaries. The station’s five minute-long promotional video promises “hard news by day,” and “straight talk by night.” A ribbon is being cut by the Right’s hero of the moment, Toronto mayor Rob Ford. In his congratulatory remarks, Ford mouths the Fox News motto: “fair and balanced” which, of course, is 180 degrees from the truth. Slick, fast-paced on-screen graphics, in Fox News style, seem intended to disorient viewers and make them more receptive to the station’s messages. The appeal to populism is ironic given that Sun News is owned by one of Canada’s wealthiest families. Sun News is a subsidiary of Quebecor Inc., which is controlled by Erik and Pierre Karl Peladeau, who are worth $670 million, according to Canadian Business’s most recent rankings. Traditionally populism pitted the people against the elites who were screwing them-variously eastern bankers, big business, or the Canadian Pacific Railway. 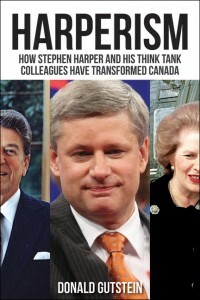 Then along came Preston Manning who, with the financial backing of Big Oil and the intellectual work of Calgary School professors (including graduate student Stephen Harper), created a fake populist party called Reform. Reform couldn’t be against Big Business because Big Business owned it, so Manning and friends fabricated new elites for the people to rail against: feminists, environmentalists, First Nations, government bureaucrats, public sectors unions, state-supported arts and cultural organizations. Anyone who supports a strong role for government programs and regulation became the people’s enemy. Sun News is infused with the same deception. Divert viewers from the people’s real enemy — the corporate elite such as the Peladeaus — and attack the “special interest” groups who aren’t 100 per cent behind the free market and conservative Christianity/Judaism. Kory Teneycke, the political operative who got the Sun News venture off the ground soon after leaving his post as Harper’s communications director, once served as an advisor to Preston Manning. So he knows the drill. Teneycke has brought together a line-up of veteran journalists, hardened ideologues and pretty faces. The daytime schedule commences at 6:00 a.m. with Neelam Verma, a former Miss Canada who holds a business degree and worked in marketing for Fortune 500 companies. Her role is likely to attract a socially conservative new Canadian audience. Thus starts the “hard news” part of the day. In the afternoon, the controversial Krista Erickson anchors Canada Live. She is controversial because in 2010, as a CBC national political reporter, she was registered as the “designated traveller” for Calgary Centre Conservative MP Lee Richardson. The hard news may not be too hard on the Conservatives. In classical Preston Manning style — Levant was a Manning parliamentary aide — Levant’s recent book Ethical Oil attempts to divert attention from the corporate villains despoiling the Alberta landscape and increasing global warming and focus instead on the governments of Venezuela and Saudi Arabia and other far-away places. Later in the evening, Charles Adler, Canada’s top conservative shock-jock contributes his virulent anti-government, anti-social justice viewpoints. He’s ably assisted by social conservative talk show host Michael Coren. Mercedes Stephenson is a recent addition to the right-wing echo chamber. She co-hosts a one-hour prime time show, The Daily Brief, with veteran reporter David Akin. Although still under 30, Stephenson is already a hardened hawk on defence and national security issues. In recent Toronto Sun columns, Stephenson accused Canadians of being apologists for terrorists, defended the director of CSIS, urged greater spending on Canada’s military, congratulated members of the Canadian Special Operations Forces who had to remain anonymous, and argued that Canadian soldiers in Afghanistan should be allowed to continue fighting until they get the job done, whatever that job might be. Stephenson shouldn’t feel lonely in the newsroom. She’ll be right at home with her fellow grads from the University of Calgary political science department — Levant and David Stiletto, who will be the Sun News official pollster, presumably torquing his questions to get the conservative responses the station desires. All three studied under conservative Calgary School professors such as Tom Flanagan. Stephenson and Levant share another link. They were recipients of Charles G. Koch fellowships that brought them to the U.S., Stephenson to work at the libertarian Cato Institute and, a decade earlier, Levant to attend the Institute for Humane Studies summer workshop, which grooms conservative activists. That’s Charles G. Koch of the billionaire Koch brothers, Fox News darlings and bankrollers to the Tea Party and to the attacks on public sector workers in Wisconsin, Ohio and elsewhere. How far will Sun News follow the Fox News format? One consequence of the station’s toxic stew of lies, distortions and half-truths is that Fox News viewers are more ignorant of important political issues than consumers of other media. A World Public Opinion study of the U.S. electorate during the 2010 mid-term election found some interesting trends. This was a survey of what people actually know, in contrast to most public opinion surveys, which simply measure what people think. Was President Barack Obama born in the United States? 63 per cent of regular Fox News viewers said “no,” compared to 22 per cent of PBS and National Public Radio viewers and listeners. Do most scientists think climate change is not occurring? 60 per cent of Fox News viewers said “yes,” compared to 25 per cent of CNN viewers, 20 per cent of MSNBC viewers and 13 per cent of PBS/NPR viewers/listeners. Fox News viewers were more ignorant on just about every issue that arose during the 2010 election. No wonder the Republicans did so well. Harper must be waiting — impatiently — for a similar set-up here in Canada. Sun News has been pitching its wares to its captive audience of Sun newspaper readers. This includes major Sun dailies in Calgary, Edmonton, Winnipeg, Toronto and Ottawa, plus the Journal de Montreal and Journal de Quebec, with a total of nearly two million readers. Quebecor also distributes the free 24 Hours papers in major urban centres. And it has a line-up of free community dailies and weeklies in small towns across the country. In Ontario alone, Quebecor owns 26 dailies and weeklies, such as the Barrie Examiner and Niagara Falls Review. These papers circulate in southern Ontario electoral ridings where Harper has made great inroads into the former Liberal heartland. The Republican noise machine was first described by David Brock in his 2004 bestseller by the same name. Brock, who had been a covert right-wing operative until he became disgusted by the lies and dirty tricks, went on to found Media Matters for America, which daily exposes right-wing media lies and distortions. There’s plenty to keep him busy, much of it coming from Fox News. With the imminent arrival of Sun News, it may be time for progressives in Canada to create our own media watchdog.